The Vespas tour will take guests to sample the best dishes that Vietnam has to offer! This is a great way to see parts of the city that most tourists don't get to see or even hear about. Taking you to the most popular street stalls, hidden alleyways and of course where the locals love to hang out with their friends. Vespa tours start from your hotel, then drive you to a crowded street café where we experience the hustle and bustle of this city with popular lemon-tea drinks and sunflower seeds. Continuing to town in one of the most busy beautifull place for joung people come here to meeting friend and take photo from Opera house. The tour then takes you to to see ceramic road and Chuong Duong bridge to have a glimpse of Hanoi on the two banks of red river. 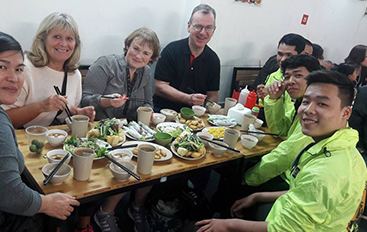 The exciting ride in an organized chaos traffic takes us to local restaurant with authentic food and then take us to mall alley to try a different version of Pho a Vietnamese dish that is world famous and try many different food from here . A ride around the big lake is a super romantic sight of Hanoi that most travelers rarely have a chance to see. Which you will experience a big "wow" factor. This will surely make you say "I’m happy that I did this trip"! Moving forward with the tour, ride vespa around Hanoi city drive pass Ho Chi Minh mausoleum,a few minute stop for egg coffee one of the most famous of coffee in Hanoi ,Now it's time to hang out with the young Hanoian crowd in a local Bar with live trendy music. Here you will have an opportunity to take the stage and perform yourself or listen to local musical talent performing both in Vietnamese and English showing off their unique style. 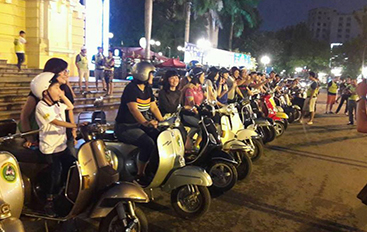 Come with us on Vespa Tours and experience your own personal Hanoi, making new friendships. The tour was amazing! I had not been in a motorcycle in over 32 years, so I was scared going in. My tour guide Tri was so knowledgeable and helpful with all of my questions, he was so careful with driving as he knew I was scared. Not only was it an overview of the coolest places in the city but also tried 5-6 different plates and 2 local drinks- food was incredible . I was super impressed with professionalism and the amount of fun I had. Wish I could have more time to do more. Vespa Night Food Tour Absolutely highly recommended. Fabtastic fun. Wonderful, informative & friendly guides. Great way to see Hanoi. Yummy food.